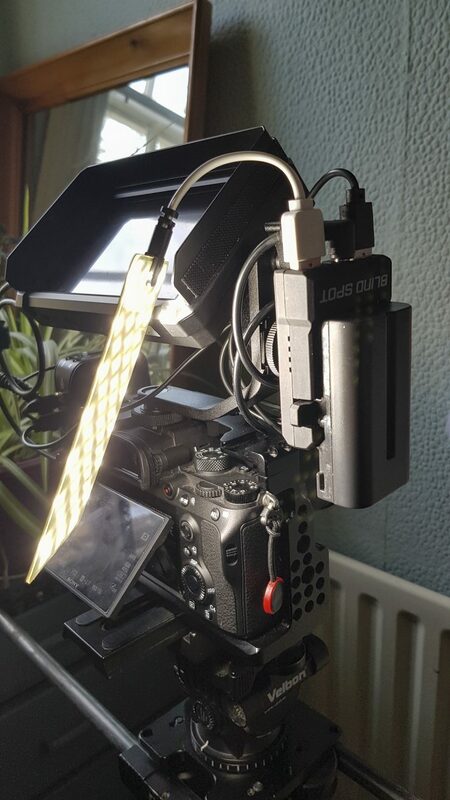 Some new camera gear garners more interest than others, but there is always that one piece of equipment that makes you think “What a great idea, why hasn’t anyone done this before?”. 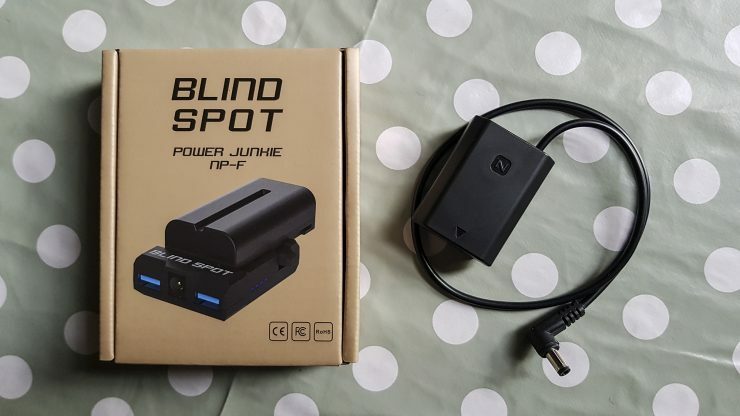 The Blind Spot Power Junkie NP-F is exactly one of those. 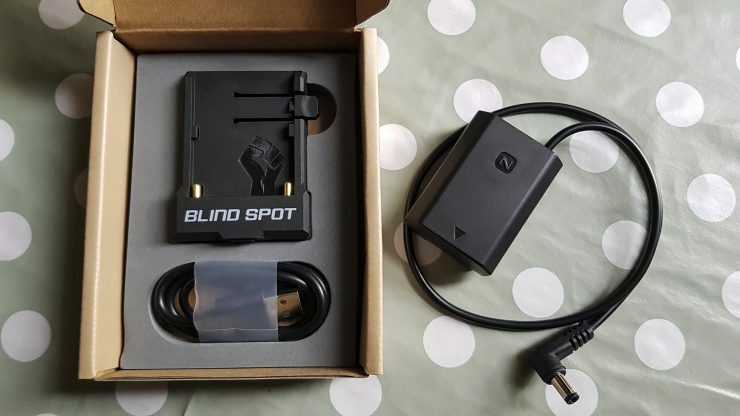 The Blind Spot Gear Power Junkie NP-F that was first announced as a Kickstarter campaign is now shipping. The overall build quality of the Power Junkie NP-F is fairly good, it feels sturdy and built to last. I had no concerns throwing it into my already packed bag. 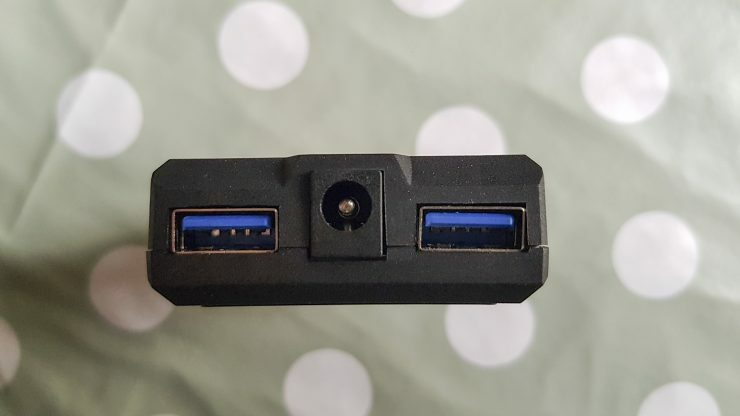 The ports on the copy I received weren’t quite as perfect looking as you might find on an Apple product but they all worked and weren’t too tight or too loose as can be the case with some products, especially the micro USB sockets. Even though everything works, cosmetically it could be better. 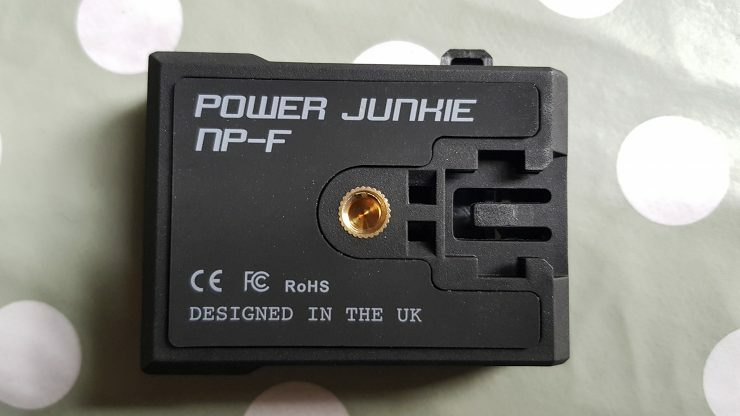 The Power Junkie NP-F is a tiny fibre reinforced composite Sony NP-F (aka L series) battery plate with 2 USB (2.8A max output with overload protection) and one 7.2V DC barrel outputs (with overload and short protection – a self resetting fuse) that can be used simultaneously. It also doubles as an NP-F battery charger with micro and USB C inputs. It has 4 blue indicator LED’s on the side of the unit that tells you the charge left in your NP-F. It also lets you know the charging state if it is being used to charge a battery. The unit also features an error indication LED if something is amiss. The claimed charge time for an NP-F 550/570 is approximately 2 hours which in my testing seems to be about right. The indicator lights on the Power Junkie let you know how the charging is progressing which is a lot more useful than the more common “red until it goes green” light on most NP-F chargers. You can also purchase a dummy battery for your camera with the Power Junkie NP-F and the list of supported cameras is extensive (see full list at the end of this article). It even comes with a USB C cable for charging. The easy to access battery release lever is also very well placed making the batteries easy to swap out on the Power Junkie, this is often overlooked on other gear I have used where it ends up placed in such a way as the only way to release the battery involves crushing a finger. 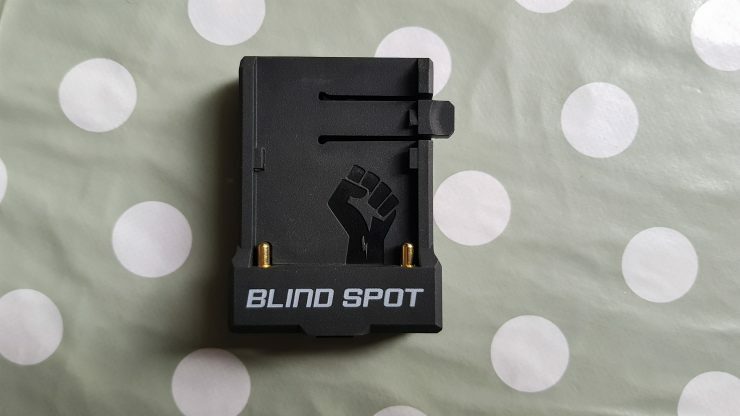 Plus, and the importance of this shouldn’t be overlooked, it has a super cool clenched fist logo in the battery tray. All of this adds up to the Power Junkie NP-F being a very versatile, low cost powering (and NP-F charging) solution for a huge number of devices. As far as mounting is concerned, the unit has multiple mounting options including a solid brass 1/4-20 thread, cold shoe, and holes for zip ties. The Power Junkie is relatively easy to mount as it only weighs (37g). The total power draw of all 3 ports is 20W, with the combined USB output at 14W. There are some limitations on what you can connect to the Power Junkie at the same time, but these are to do with the batteries themselves and not a limitation of the Power Junkie NP-F itself. Say, for example, you wish to power 2 small USB lamps which are rated at 5v, 1a = 5W. 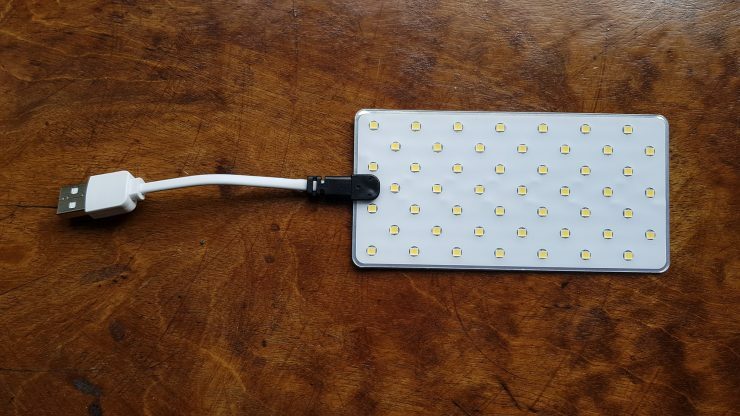 By adding the two accessories ratings together: 5w + 5w = 10w this is less than the rated maximum of 14w so these devices are ok to use together. If the Power Junkie NP-F is overloaded some or all of the ports will shut down and error codes will be displayed via the built-in LEDs. It is also possible to overload the NP-F batteries themselves which may cause the batteries internal protection circuit to shut down the battery. Blind Spot says that if you use their batteries the Power Junkie NP-F unit should overload before the battery and safely shut down the outputs. This may not be the case with other battery brands. I’ve been using the Power Junkie with off-brand eBay NP-F’s for a while now with no problems. One other possible issue is caused by what is known as a ground loop. 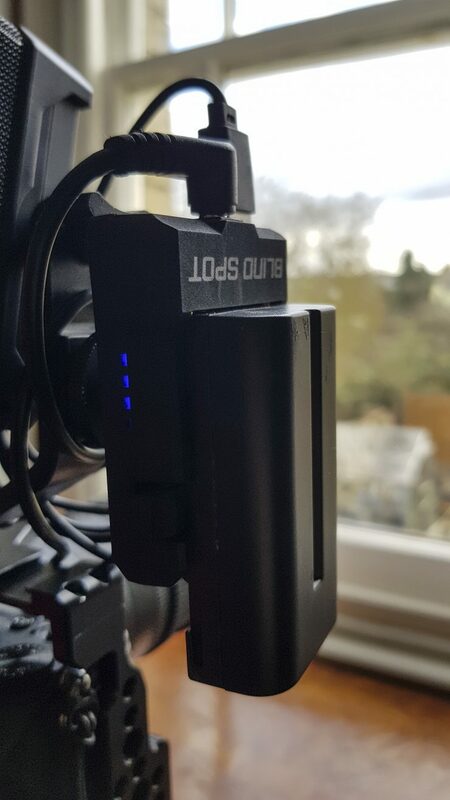 An example of when you may encounter this problem is if you are powering your camera with a dummy battery attached to the Power Junkie NP-F whilst also powering a wireless mic receiver (or another audio device) from one of the USB ports. A ground loop happens when 2 different devices are connected to the ports on the Power Junkie NP-F. The voltage in cable A is always slightly different to that in cable B, this subsequently causes a tiny amount of power to flow down the audio cable causing significant and unpleasant noise in the audio signal. This is not an issue with the Power Junkie NP-F itself but one of physics. I encountered this issue when I first received the Power Junkie NP-F and reached out to Blind Spot who very quickly explained the situation and provided a fix. This came in the form of me having to purchase a cheap (£4-£10 online) ground loop isolator. A ground loop isolator is a tiny adapter that sits between the audio output of your receiver and the input of your camera. This solved the problem. I found it interesting that no one else had come across this problem in any other reviews that I have seen. Were people actually testing the Power Junkie? 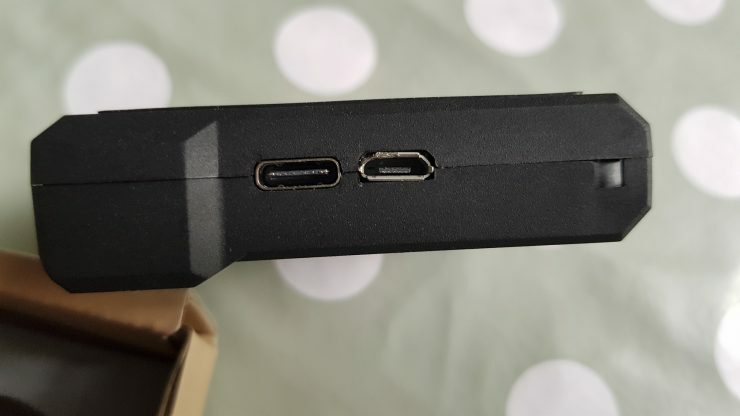 Connecting two different devices to two different ports is surely going to be something a lot of users of the Power Junkie would do. I find it hard to believe no one tried powering a wireless mic receiver and using a dummy battery at the same time. 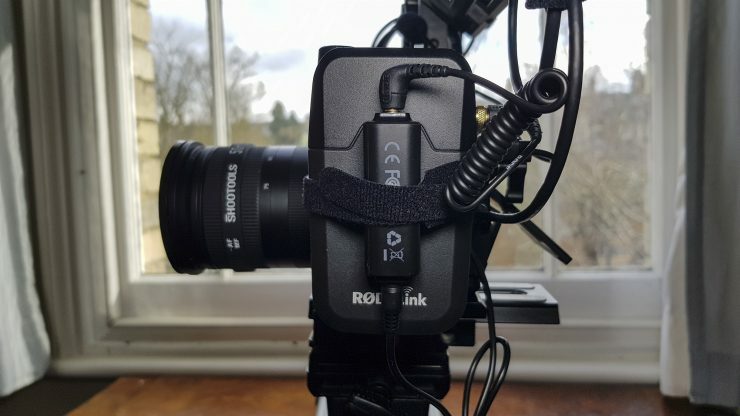 I tested the Power Junkie NP-F with a Sony A7III and RodeLink Wireless Lav system over a number of shoots and found it to be rock solid. It’s difficult to give run time estimates as it depends largely on what battery, what brand of battery, and what you have plugged into the Power Junkie NP-F. 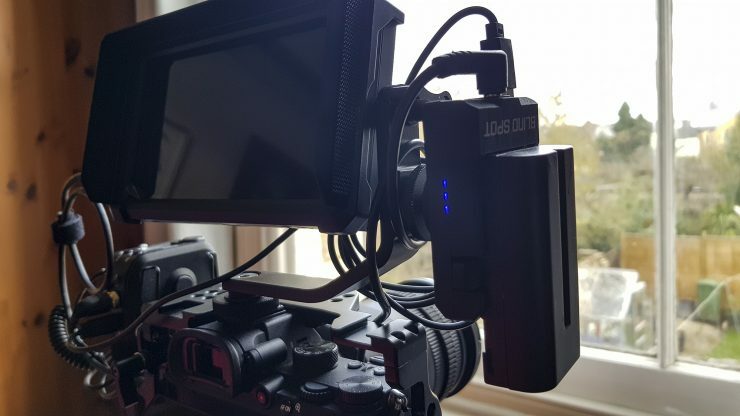 I found the smallest NP-F 550 battery would power my Sony a7III and my RodeLink Wireless receiver for roughly the same time as the cameras internal battery powering the camera alone. The camera also displayed what seemed to be an accurate battery percentage reading when using the Blind Spot dummy NP-FZ100 battery. The larger NP-F 960’s (6600mAh) lasted significantly longer as you would expect. I would have loved to have had the Power Junkie with my previous a7SII as anyone who uses one will know the battery life is horrible. It was necessary for me to carry around 6-8 batteries and a charger for a day of shooting. A Power Junkie NP-F and a couple of NP-F 960’s would have let me run all day. Blind Spot Gear also sent me a preview of their latest Kickstarter product, the Crack Light, which pairs perfectly with the Power Junkie NP-F.
A 12cm x 6cm, 19g, thin, waterproof, 5W, 94.6 CRI, 134 LUX @ 1m LED light that comes in a daylight and tungsten version and can be powered by any 5V source. That means you can run 2 from the PowerJunkie, or even power it with your phone with an adapter. The Power Junkie retails for £49. If you are using a camera where the internal battery life is less than desirable the Power Junkie NP-F makes an awful lot of sense, especially given the cost of most OEM camera batteries. All in all the Power Junkie is a good idea for anyone who has Sony NP-F batteries lying around. 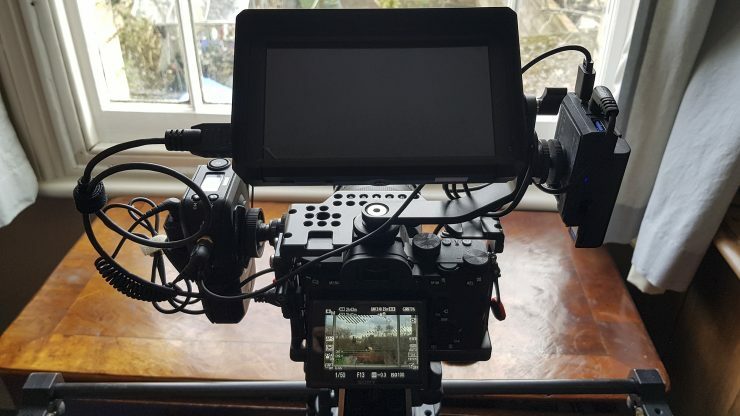 It’s versatility and tiny footprint make it something that will live permanently attached to my camera rig. In fact I want another one now to put in my bag and use for charging my phone, small LED lights and my NP-F batteries on the go. EP-5A (EN-EL14 Nikon Dummy) – Compatible Cameras: Nikon D3100, Nikon D3200, Nikon D3300, Nikon D3400, Nikon D3500, Nikon D5100, Nikon D5200, Nikon D5300, Nikon D5500, Nikon COOLPIX P7000, Nikon COOLPIX P7100, Nikon COOLPIX P7800 and any other camera using a EN-EL14 battery. He has traveled extensively and lived in Asia for 20 years with extended periods in India, Thailand and Japan. Adrain is a self-confessed recovering ex-pat currently based in the UK, where he works as a filmmaker, camera owner/operator, editor and freelance photographer.